Electrodiagnostic examination (EDX) consists of two major parts: nerve conduction studies (NCS), including long latency reflex testing (F-waves), and needle electromyography (EMG). In addition, somatosensory evoked potentials and magnetic stimulation motor evoked potentials are needed sometimes, but the two latter techniques are outside the scope of this chapter. NCS and EMG are usually performed together. 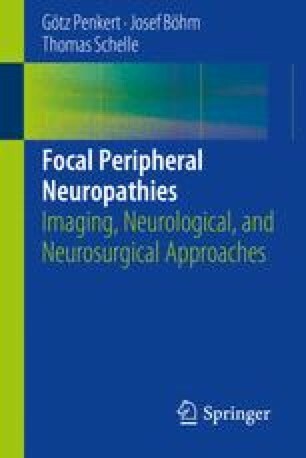 In contrast to nerve imaging such as magnetic resonance imaging (MRI) and high-resolution ultrasound (HRUS) (see Chap. 6), EDX provides functional information about the electrical properties of the peripheral nerves. EDX should only be carried out by specially trained staff, such as by a certified physician, or under his or her direct supervision .